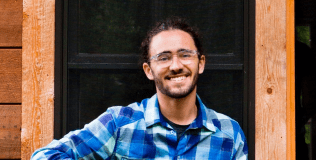 I love Ethan's focus here at Cloud Coach, not on showing off the fanciest new gagdets on the market but on showcasing simple tools that you might already be using, and showing you how to use them better. I couldn't be more enthusiastic about Gmail than he is, but in my opinion he hasn't gone far enough in evangelizing all the great free products you can use to streamline your organizational system. My organizational system is divided into two parts; I have the regularly occuring, habitual stuff that happens week after week, month after month, like clients and inventory and bookkeeping, and I have the ‘novel' projects; one-time projects that either never happen again (writing a book) or that once created, rolls over into the regularly scheduled programming, like creating a new service. 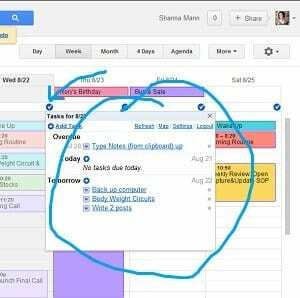 You can have almost as much fun in the labs in Gcal as in Gmail, but the real ringer for me is the extra calendar feature that syncs my Remember The Milk account to my Gcal. I use Remember the Milk for one thing: The recurring tasks that I have to do on a regular basis. This ensures that I never think, “Oh, look that Friday is free! I can take off early for the weekend,” only to later realize that I have the month-end bookkeeping to do. This also means that when I make up my daily to-do list, I already have, on one screen, my daily appointments and the standard duties, so that I know, realistically, if I will have time to work on a bigger, one-off project like an info product. My one concession to off-line productivity is to have this sticky note program downloaded to my computer. After I review my Gcal/RTM screen for the day, I type my todo list on a sticky note that pins to my desktop so I have just as much information as I need and no more, and I don't have to keep my browser open all day. If you are switching devices, though, keep in mind that this program doesn't sync. Although you could just use a regular sticky-note, if you wanted to be all lo-fi and kill a tree ;). The biggest pain about project management, I find, is getting all documents and pages open at once, without forgetting any, and without getting distracted by clicking over to Gawker. There are some very nice options, like Basecamp for project management, but they're not free, and they're a bit more fully featured than what I need. I use Workflowy, which is an extremely simple and intuitive software based on bulleted lists. 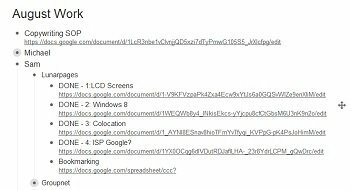 It supports HTML links so if I embed a list of links (to webpages or Google docs) that I need for any project, it's a simple matter to open whatever I need, right from one screen. Navigating on Workflowy is dead simple, so you can zoom in or out as much as you like, and I find it so much easier to concentrate when I'm not constantly diving into my Google docs looking for drafts, or tracking down a spreadsheet or bookmark. For the best possible implementation, I use tabs in Chrome to open ONLY the pages and documents I'm using on that project. If I'm doing another project simultaneously, it's on a different window of Chrome, with all its supporting tabs. That way I can't be distracted by a different project, but they're easy to switch to if I want to. That's my system, all free and reasonably streamlined. I hope it gave you ideas for your own system, and if you have any suggestions I'd love to hear them! Shanna Mann is a serial entrepreneur as well as a business coach for solopreneurs, helping first time business owners put everything together. Her home base is ShannaMann.com.